The Palace is the first road racing frame from new British bike manufacturer Bowman. Designed and developed in Kent and built in Taiwan, the Palace is part of Bowman’s current range of three aluminium frames, all with names that nod to their English cycling heritage; the Palace’s stablemates being the Foots Cray cyclo-cross frame and the Pilgrims all-road adventure bike frame. The Palace is named after South London’s super-tough Tuesday evening crit races in Crystal Palace park. The Palace tag not only references the fast-cornering, hard-sprinting credentials to which Bowman has aspired with this frame, but also the ride-up-and-race cycling club culture that is its raison d’être. In that vein there is a lot to recommend the Bowman Palace. For some time now many of us have been banging on about the advantages of a more expensive aluminium frame over a cheaper carbon one. Kinesis appears to have abandoned carbon altogether, producing its top-end models from Kinesium and titanium, while Specialized recently released a rather expensive, limited-edition Allez, in E5 aluminium. Genesis had been showing that steel can still hold its own in the pro peloton (until this year’s Tour of Britain), but the thing about aluminium is that it is not a retro-grade material. Continuing developments in the forming processes mean that it can be drawn and formed to different thickness, weights and shapes — still perfectly good for making race bikes. The Palace frame comes in at a respectable 1.2kg, a good basis for a light road bike, or a very light one depending on the kind of budget you’re going to throw at your build. 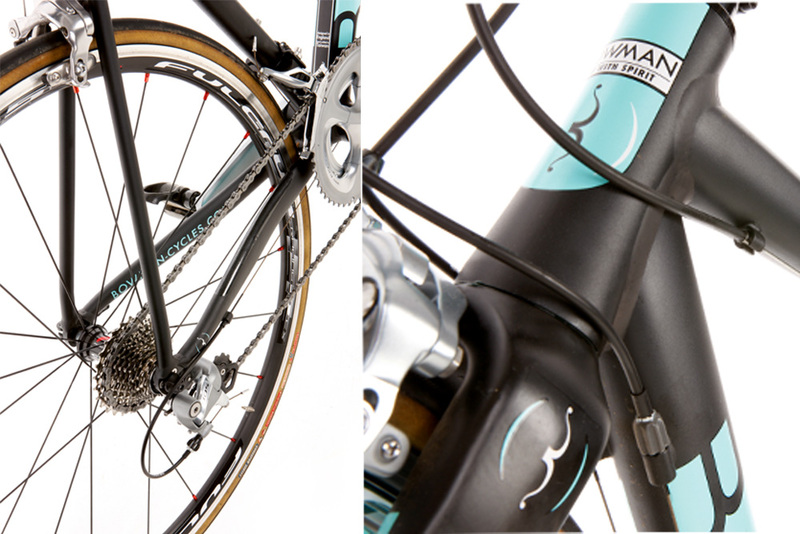 Our build was based around Shimano 105, with some decent finishing kit and Fulcrum 5 wheels. This made for a sound fledgling racing bike, still feeling pretty light. Upgrade into Shimano Ultegra or SRAM Force territory and the Palace will really come alive. And, as Bowman points out, the tough anodised 6069 grade aluminium frame is well suited to the “rough and tumble of amateur bike racing, but also to the demands of everyday cycling and training”. There is a carbon element to this frameset though, in the form of Bowman’s own full-carbon monocoque fork, with a tapered steerer. This is, after all, a frameset designed primarily for road racing. For every one of the Palace’s race credentials there are little considered real-world touches. The PF86 bottom bracket means that you get push-fit internal bearings that will take a Shimano crankset. There is easy to maintain external cable routing and while, as you would expect from a race frame, there are no mudguard fixings, there is sufficient clearance for 28mm tyres. The Palace is an attractive and distinctive frame, in anodised black with pale blue/turquoise details and Bowman’s ‘Ride with Spirit’ logo. But the standout feature of the Palace frameset is the ride. For something name-checking the often savage Crystal Palace crits the Palace offers a remarkably well-mannered ride. It is a stiff frame, the tubes are shaped to create full interfaces at the head tube, the down tube and the top tube. The effect is evident in the Palace’s acceleration and its willingness to climb. The handling is spot-on too; sharp but assured in corners, allowing you that extra correction and to push a little bit more in the turn. Bowman seems to have nailed the balance between rigidity, weight and compliance that is the key to a fast bike, and riding the Palace reminds you how much a bike’s good manners contribute to your power, particularly on a less than perfect surface. In fact we would go as far as saying it faired as well as many of the rough road specialists. We really like what Bowman is doing with the brand. The references to London and the south-east’s riding scene won’t immediately chime with everyone but its commitment to racing and its passion for cycling will. The Palace, like some others, has proved that Bowman can still innovate and indeed surprise with an aluminium frame. It’s a frame that you can race with and live with and is well worth a look if you’re after something different. Bowman currently has four frames planned for release over 2015, including the Palace. Next up should be the Pilgrims, which represents its entry into the emerging adventure road/gravel bike market. It will be disc brake specific and the aluminium frame will feature plenty of clearance for big fat tyres.